CD+DVD 6 pages digipak, 16 pages booklet. 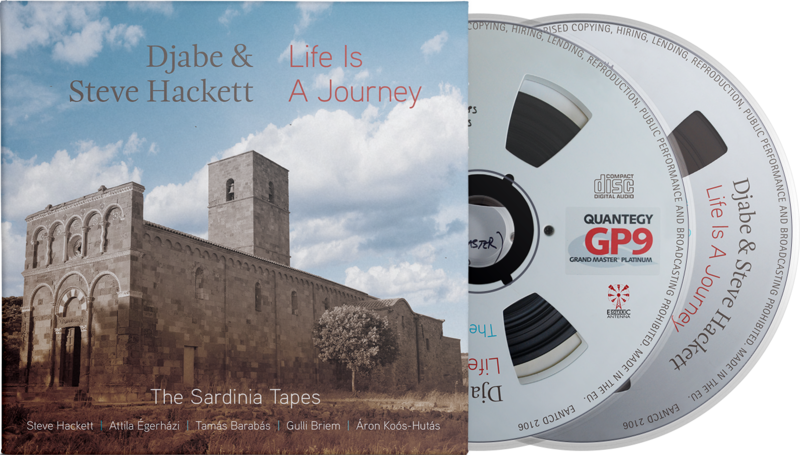 At the summer of 2016 Steve Hackett and the musicians of Djabe travelled to the island of Sardinia, and built an temporary recording studio in next to the 1000-year old temple Nostra Signora di Tergu, and spent 3 whole days recording. Between recordings, they explored the island and received inspiration from the natural beauty and rich culture of Sardinia. The 24-track analogue session tapes, were taken to Budapest and Tamás Barabás, bass guitarist and composer of Djabe produced a whole album from the jams. A unique studio album was born, washing away genre borders between progressive rock, jazz and world music, and moved into the category best described as instrumental progressive music. The album features a unique line-up of Djabe, with drums helmed by Gulli Briem, famous drummer of the widely known Mezzoforte. Áron Koós-Hutás plays the trumpet. The first studio album featuring co-written compositions of Djabe and Steve Hackett was finished, praised by music critics as one of the most awaited albums of 2017, around the world. CD contains 11 compositions of 73-min length altogether. DVD contains the complete album in 24bit/96kHz resolution in stereo and surround version. The DVD also features a 5-min documentary of the recordings, shot by members of the band, along with a 21-min concert film. The latter recorded on July 3, 2017 in Budapest Jazz Club, Hungary, where Djabe performed with Gulli Briem and Steve Hackett. The concert video presents classics like Fly On A Windshield by Genesis, or the defining work of Hackett, Please Don’t Touch.